Business intelligence (BI) and reporting tools can enable organisations to take their reporting to the next level, beyond the capabilities of Excel spreadsheets. Excel is the common reporting tool used amongst all members of the finance team who extract (or re-key) figures from accounting systems and various other data sources in order to add further analysis, make adjustments and improve the presentation of reports before distributing the final results to management. While Excel is a much favoured and familiar reporting tool it has its drawbacks, from spreadsheet errors, to no visible audit trail. We partner with Infor and Sharperlight to help organisations overcome these reporting challenges. We have been an Infor partner since 1987 and a Sharperlight partner since 2012. Your reporting solution lacks the functionality required to meet your existing or future reporting requirements. Its one-size-fits-all strategy leaves no flexibility. You are unable to combine data into one report from multiple data sources. There is one-way read only functionality, no ‘write-back’ capabilities. There is no real time visibility. You have to collect/import/re-key data manually from different data sources in order to produce a report, which is hugely time consuming. Where new or ad-hoc reports are required you rely heavily on your IT department to create these reports. This results in delays of days, sometimes weeks, as IT resource assistance needs to be requested and scheduled. In the meantime, manual re-keying of data into spreadsheets becomes the only way to produce the required reports, which is time consuming, prone to errors and inefficient. When preparing reports for the board/other stakeholders, output from ERP reports needs to be cut and pasted into spreadsheets to enable additional formatting to be applied in order to make reports visually acceptable. We help organisations meet their existing and future reporting requirements by providing a range of business intelligence and reporting solutions that enable users to get control of their data with rapid analysis and drill down, with simple to use query engines, over single, or multiple systems simultaneously. We engage with our clients to determine their high-level business and technical requirements and design an initial project plan. We build and deploy business intelligence and reporting solutions that meet the requirements of the client. We provide ongoing support, training and strategic reviews to ensure the smooth running of our client’s operation. The Eclipse Lifecycle Services Framework is the embodiment of our own best practice, enabling us to deliver solutions to organisations in an extremely efficient and cost effective way. 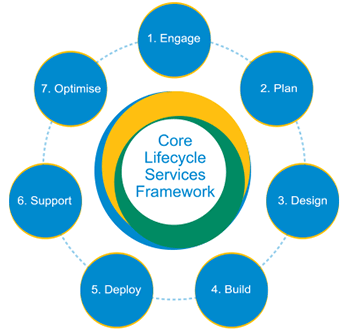 The Eclipse Lifecycle Services Framework comprises 7 distinct stages: Engage; Plan; Design; Build; Deploy; Support; Optimise. We provide extensive training and support throughout the Lifecycle Services Framework cycle. Each stage of the lifecycle has specific outputs and deliverables, which means that your organisation can clearly see what they are paying for at the point of engagement. It also ensures you have peace of mind knowing that there will be no shortcuts even if we are capable of delivering our solutions faster and more efficiently than traditionally expected. Download the Eclipse Lifecycle Services Framework brochure. We provide a range of business intelligence and reporting solutions, including: Sharperlight, Infor Query and Analysis (Vision), Infor d/EPM and Infor XBRL. Tired of the old approaches to finance & accounting? Then why not get in touch and we will arrange a call for you with our CEO Gary Waylett. Discuss your business challenges and find out which of our solutions and services can help you. Rob Daw, Principal Consultant MiPlan Consulting.